What happens when fashion and creativity come together? Enter the world of Romance Was Born and get ready to express yourself with this new activity book for kids. This beautifully presented and visually stimulating book inspires children of all ages to use their imaginations, be creative and have fun! Full of vibrant colour, creative patterns and plenty of inspiration, it is jam-packed with opportunity to draw and create. You will get to know Australian fashion designers Anna Plunkett and Luke Sales, of Romance Was Born, and find out where their ideas come from as they experiment with designs and materials to create spectacular outfits. Children will discover their own inner fashion designer as they weave their way through this book to create their very own garments through hands-on activities based on the Romance Was Born collections. 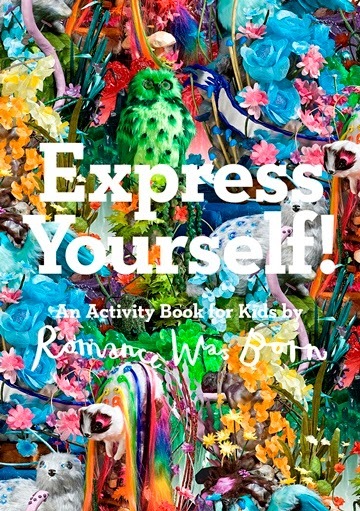 Romance Was Born wants children to have fun and let ideas in one by one. From designing your own shoes, creating your own pair of pants from a tee-shirt, and making a magic cape, through to decorating hats and handbags, this activity book will keep young creators entertained and inspired for days. There are step by step instructions and templates, as well as opportunity to draw and design freely as imagination takes over. Express Yourself! is the perfect book for budding young designers, or simply those who love to draw and create.